Better Streets has taken a keen interest in the local elections – it’s local councils after all who are responsible for most of our streets. We’ve asked each political party leader to take our pledge , alongside the London-wide Liveable London campaign asking residents to email the leaders en masse. The Green party fully supported it and Labour supported the pledge but modified it on the basis of their version of Quieter Neighbourhood (watering it down). While the Conservatives and Liberal Democrats made opposing Cycle Enfield a major part of their campaigns. So what would be the outcome of polling day on Thursday 3 May? Who’s taken the better streets pledge? April 19, 2018 / admin / Comments Off on Who’s taken the better streets pledge? A few weeks ago we got in touch with Enfield’s four main political parties, and asked them to pledge to create better streets if they won the council in the May local elections. 3) Completing the work of Cycle Enfield, to allow all-age, all-ability cycling throughout the borough. April 18, 2018 / admin / Comments Off on Dangerous orcas and bus stop boarders? As the local elections approach, a lot has been said about the cycle lanes – with opposition parties in particular accusing the council of using features that are dangerous. April 12, 2018 / admin / Comments Off on Do you want a liveable Enfield? 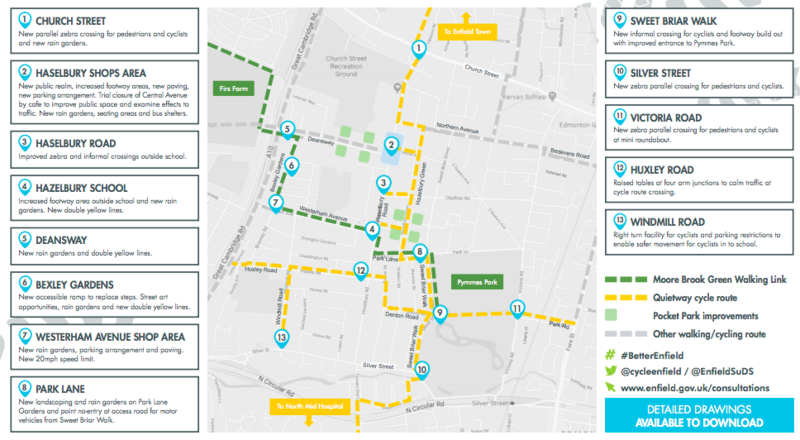 Would you like an Enfield that’s “liveable” – where streets are much less dominated by traffic, and much more pleasant for walking, cycling and spending time? That’s the goal of the My Liveable London campaign. If so – can you help? From next week we will need volunteers to distribute “My Liveable Enfield” leaflets, asking the public to email Enfield party leaders before the local elections. We’re delighted to announce that Enfield Green Party are the first party to take our pledge for better streets in the run-up to the May local elections! We’re also hoping to hear from the local Labour, Liberal Democrat and Conservative parties. 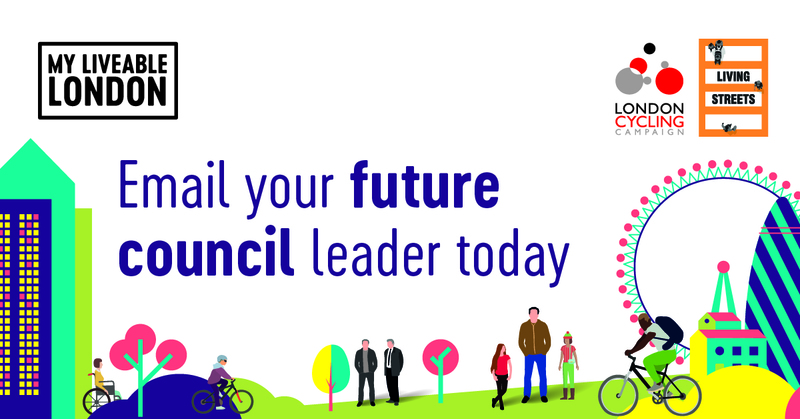 We believe that making our streets safer, greener, cleaner and less traffic-dominated for everyone cuts across party lines – this is surely a goal that every candidate should support. 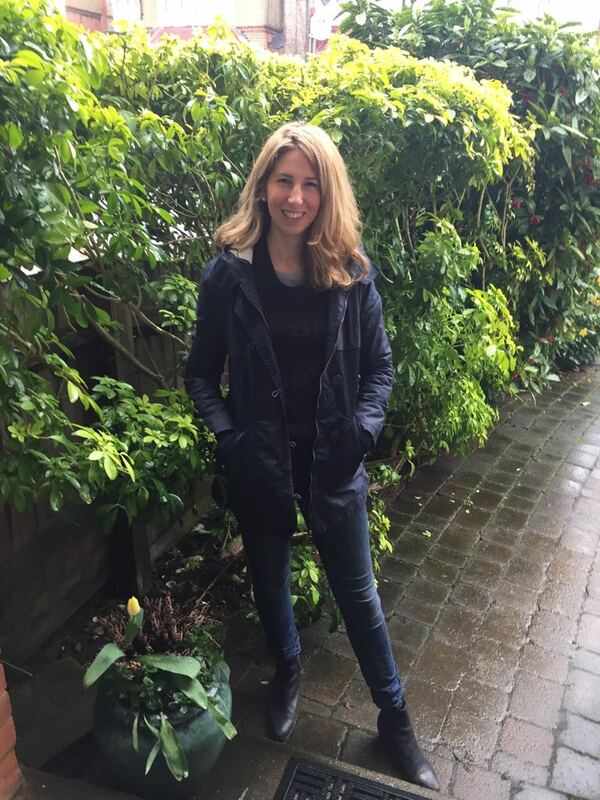 Meet Claire Hill, the Winchmore Hill mum-of-three on a mission to make N21 a plastic-free zone. One of our key wants here at Better Streets is cleaner, greener streets, so we were keen to catch up with Hill, a pioneering eco-warrior who’s passionate about pollution and clean air – and who’s aiming to make Winchmore Hill Enfield’s first plastic-free postcode. What inspired you to try to eradicate single-use plastic from your neighbourhood? I read Geography at university and have always been passionate about environmental issues. Last summer I went on holiday to Italy and within five minutes had fished numerous pieces of plastic from the sea. I was horrified to see people swimming around plastic like it was normal. Blue Planet 2 and the national action that has followed has raised the issue of plastic in the environment and so it feels like a good time to build on this. Yes, please join me! This Saturday (14 April), at 2pm, a group of us are politely returning all the single-use plastic we’ve accumulated from the Sainsbury’s store in Winchmore Hill, with a letter to the manager, to make a very visible statement about supermarket packaging. This is part of a monthly national initiative organised through the Facebook group #notourplasticproblem. How else can we reduce plastic waste in the borough? Big changes can start at the local level. There is so much we can do individually and as a community to tackle this problem. Buy reusable bottles for water and hot drinks, take reusable bags for local shopping as well as those big supermarket shops and choose natural fibres when buying new clothes. Synthetic fibres create micro-fibre pollution. Also, say no to plastic straws and buy wooden toothbrushes. Some shops are now offering a discount if you bring a reusable cup. I’d love to see this offered locally and for Winchmore Hill to become a plastic bag free zone. How else can we improve our local environment? I think we need to take action now on many environmental issues. I am very concerned about air pollution in Enfield – so the bike lanes are a great start in hopefully encouraging people to cycle rather than drive short journeys. I would also love to see even more street trees planted across the borough. The loss of front gardens to car parking, and the placement of utility access boxes, are a real threat to the street tree. Some of the most beautiful streets in London have one thing in common: beautiful trees. And they help our lungs. What do your kids think about your campaigning? Yesterday saw a day we have been looking forward to for a very long time – the launch of the completed A105 route through Enfield. The A105 (Green Lanes) now offers safe space for cycling all the way from Palmerston Crescent at the North Circular up to Enfield Town – a distance of over three miles. As well as bike lanes it’s got remodelled junctions, more planting, seating, new paving and decluttered town centres. It’s been transformed. The launch was even better than we’d hoped. 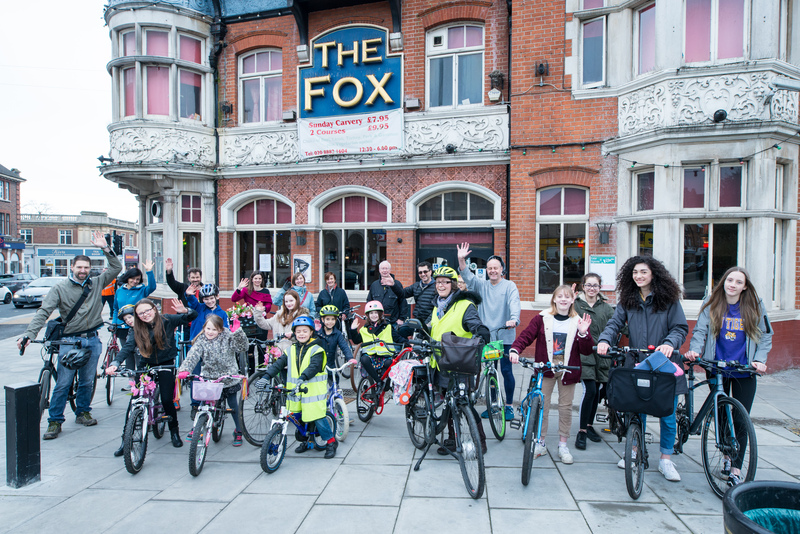 Not only did the rain hold off all afternoon, but more than 200 people of all ages turned up take part in riding and celebrating the new cycle lanes. What a day! I joined one group of residents coming from Palmers Green and we gathered outside The Fox pub.